Physical stress symptoms vary by the individual-these symptoms are appeals from the body/mind to pay attention! Headaches, clenched jaws, tight shoulders, back pain, digestive disorders, and other manifestations are signals that we need to regroup and tune in to ourselves. Attention to our breath, habits of our body, thinking patterns that do not serve us and removing ourselves from unhealthy life situations will help to decrease susceptibility to illness . All of these are part of what we learn in yoga practice. Our stress symptoms manifest in areas where we are vulnerable-often called our “weak links”. As I discussed in this post, a synonym for the yoga experience is indeed awareness. With regular intelligent practice of physical postures, meditation and yogic breathing, we can systematically awaken to habits that do not serve us, and become fortified for the inevitable internal and external fluctuations of our lives. 1. Automobile accidents: On 2 separate occasions in a 3 year period I was rear ended by distracted drivers. 2. Childbirth: Unrelenting back labor and joint vulnerability from relaxin paired with less than optimal post natal alignment. Birth story here. 3. Weaknesses in the muscles surrounding the sacrum. My recovery from my first major sacral incident (not simply a sore back; actually unrelenting spasms in the tissues) took at least 3 months. I taught yoga throughout and worked with a chiropractor weekly in the early stages of recovery. Recently for no apparent reason, I had a second incident. Here are three of the preventative practices I have been practicing over the last few years that have supported my exponentially improved recovery timeline: 3 days! 1. Sunbird is a surprisingly effective core stabilizing yoga posture that strengthens the erector spinae muscles, as well as the gluteals. Note the padding for knees and wrists. Hold each side for a few breaths then alternate opposite arm and leg. 1. Sunbird. 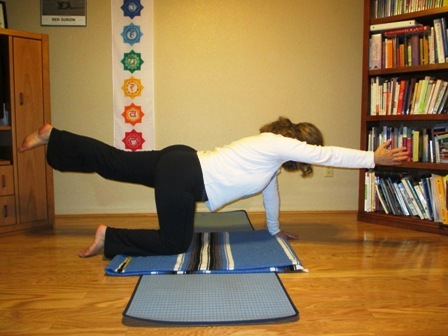 This yoga core stabilizer is available to most of my students. Some start with the both hands on the ground and stretch only legs to start keeping hips and shoulders aligned. I also share this with prenatal yoga students. 2. Toe Touches or Marching. Arms can be overhead or by your side. Try to keep the spine and the ribs from flaring up toward the ceiling from overarching. Feel as if movement is coming from the core. 2. Toe Touches or Marching. The slower you alternate legs the more you will stabilize your core and strengthen hip flexors. You can progress to straight knee and both legs at once. 3. Pelvic tilts. Here I’m purposely extending my lower back tilting pelvis forward. Look closely at the subtle difference between this and the first photo. 3. Pelvic tilts. Feeling lower back pressed against the wall allowing the wall to provide resistance as your core muscles engage. 3. Pelvic Tilts. You can see the subtle difference at my lumbar spine between the 2 photos. This move brings awareness of pelvic and lower back alignment, and strengthens the erector spinae muscles. Inhale feeling a gentle arch in the lower back and exhale as back presses to the wall. A bonus is some quadricep strengthening! *Teachable moment: Review this link for a good visual description about sacroiliac joints and common causes of dysfunctions. +Disclaimer: The usual. Seek the advice of a medical professional who can examine you personally for a diagnosis if you are unsure if these exercises are appropriate for you or make your symptoms worse.